Sort the equipment on the correct sportist. Play as goalkeeper and defend the door from the balls. Catch all hiders in 3 game rounds. Move with arrows keys. Place the trophy on the corresponding tournament. Press space bar to roll the bowling ball and hit all bowls. Interactive brackets for FIFA World Cup 2018 in Russia. Free online learning games about sports. Fun games to explore and study the sports. 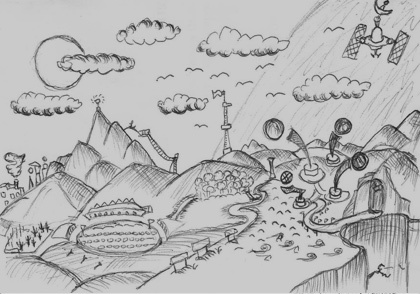 More than 20 online games, related to different sports, that may be used for fun, interactive education. 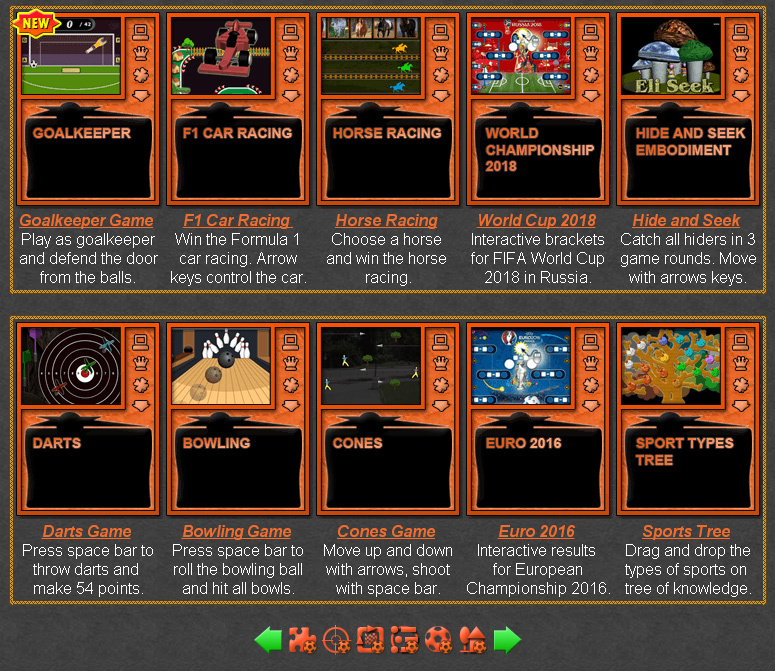 The sport knowledge games are small flash games, up to 2 MB, which include simple representation of sport games, puzzles about sport knowledge, boards about brackets and tournament results, and arcade games with simple simulation of sport and outdoor games. The sport learning games are suitable tools for recreation, examination, references and education. They may be played in schools, at home, in classes. In this category we are trying to make or collect games and similar apps about all known sports. Goalkeeper Game - Use q,a,p and l key to move the goalkeeper and do not let too many goals. Bowling Game - Play bowling online. 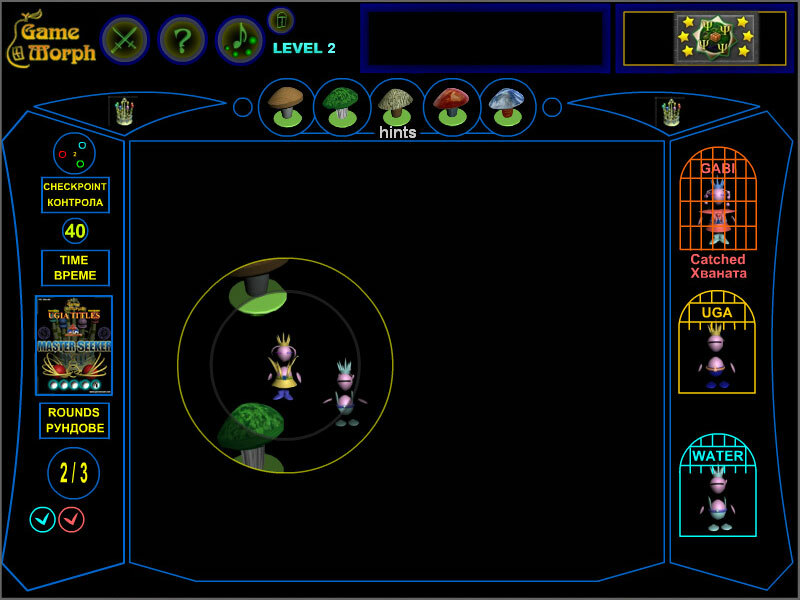 Press space bar to roll the bowling ball and hit all bowls. Darts Game - Press the dart button ot hit spacebar. Throw darts to make 54 points. Cones Game - Move up and down with arrows and shoot cones with space bar. Sport Types Tree - There are sports, you probably do not know. World Cup 2018 - Interactive brackets for the soccer championship in Russia 2018. Euro 2016 - Interactive brackets for the European soccer championship in France 2016. 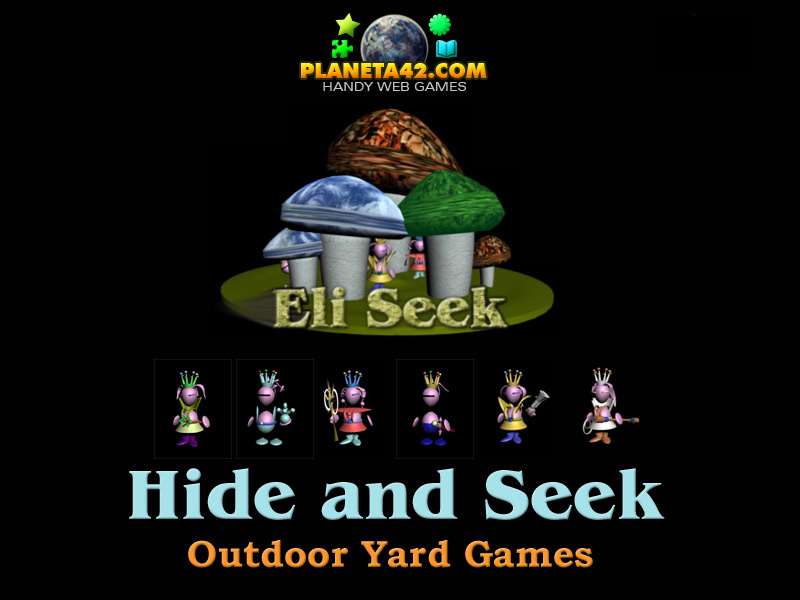 Hide and Seek - Play fun hide and seek game online with Ogo and friends. Electronic Sport Trophies - Drag and drop the tournament cups on the correct electronic sport. Sports Puzzle - Sort the equipment on the correct sportist. Baseball - Use left mouse button and try to hit the incoming ball with the bat. Fishing the Sea - Use the mouse to catch a fish and carry it to the boat. Mini Golf - Use the mouse to point the direction of the ball and the power of the shot. Pencak Silat - Use arrows to move forward and spacebar to fight or combination of punches. Interactive sports, rules and results. The "Interactive Sport Field" is a free online education web site with short fun sport games and puzzles played online in the web browser. All games are free and run on medium class computers, laptops and tablets, with installed flash player. They reward +1 Knowledge Level for every won game. Fun educational sport games, suitable for result references, e-learning, online lessons and interactive classes. The collectible sport games (download versions), goes with build in player, but the levels are not saved on the website. Free to play and download without registration. Fun minute to win sport games. Sport Puzzles - This collection include interesting knowledge about sports, types of sports and sport rules, using pictures, collages and diagrams about the sports. Shooting Sport Games - This collection include all sport games which involve shooting at targets. Sport Racing Games - This collection include all competition sport games, team games and cars. Interactive Brackets - This is a collection of schematics of famous worldwide sport tournament and interactive almanac. Ball Sport Games - This collection include all sport games with balls. Yard Games - This is a collection of popular games from the childhood played outdoor and made for a computer. The Interactive Sport Fields website includes: minute to win it sport games, computer sport games, fun learning sport games, sport games for kids, knowledge games about sports, interactive sport lessons, sport games app, sports online games, free sport games, sport games unblocked, sport games free download, sports games pc, fun educational sport games, sports homework, online sport learning games, fun school sport games, online school games, free educational games, games about sports, free school sport games, sport lesson games, free online games, fun online sport games, fun sport class games, sport class games, interactive knowledge boards, sport knowledge boards, interactive brackets, sport almanacs, short sports level games and more than 20 online games, related to different sports, that may be used for fun, interactive education and examination. Here is the blog with the Exciting Collection of Sport Games.